We're throwing it back to the MySpace days of surveys. Be glad that I'm not bringing back some of my old MySpace profile pictures. Too bad for you. They were so artsy and emo and "look at how carefree I am at 19." (Selfies before there were "selfies" and edited with a heavy hand.) Ahhh, those were the days. Anyway, here's a little A to Z Blog Survey. B – Biggest Fear: Snakes! E – Easiest Person To Talk To: My dad. We have an easy time talking, and admittedly, we have an easy time getting on each other's nerves if there's a full moon and our moods are just right. ;) But that's what makes it so easy, I guess. We always know we can move past it. F – Favorite Song: For months, it's been "Bright" by Echosmith, because Presley gets really quiet and looks up at me while I sing it. Her gaze makes me feel all the mama feels. She smiles when I sing "You make me sing oooooh, la la la, You make a girl go oooooh, I'm in love, love." It melts me heart every time. We showed my parents on FaceTime, and it was simply precious! G – Grossest Memory: My first reaction was to type "Stepping on a snail," and then I thought, "Nope! CHILDBIRTH. And all the fun that happens afterward." TMI? I – In Love With: S and Press, of course! J – Jealous Of: My former self who got more sleep and fit in all of her clothes. K – Kindest Person You Know: Man, I've got some really kind friends, but if I have to narrow it down, I'll say Summer, Caitlin, and Annie. L – Longest Relationship: 9 years (and counting)! M – Middle Name: Legally, I have two. Marie and my maiden name. N – Number of Siblings: 2. O – One Wish: I chuckled as I thought about typing "I wish I was a little bit taller. I wish I was a baller. I wish I had a girl who looked good. I would call her." (1995 called. They want their lyrics back.) I'm so easily amused these days. I wish I had a million dollars, because... need I explain? P – Person You Spoke To On The Phone Last: My co-worker talked about a training we're leading next week. S – Song You Last Sang: See letter F above! T – Time You Woke Up: 12:55 AM, 3:30 AM, 5:30 AM, and 7:05 AM. Yay, motherhood! U – Underwear Color: Turquoise. V – Vacation Destination: I want to go to Rothenburg ob der Tauber, Paris, London, the Wizarding World of Harry Potter, and Farm Sanctuary. W – Worst Habit: Saving things. Great for when I need a receipt. Bad for when we have to move. X – X-Rays You’ve Had: Dental and chest. Y – Your Favorite Food: Husband's zucchini cakes. Z – Zodiac Sign: Libra. Did you learn anything new about me? If you've been dropping by here for awhile, maybe not. But maybe. Enjoy the weekend! What great insight into what your life is right now. I need to do this on my blog. Great idea! 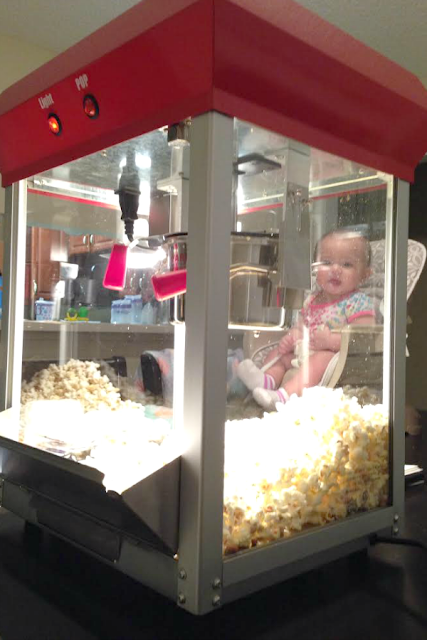 Ha ha, I love seeing Sweet P through the popcorn machine glass! I miss our talks. Love you!